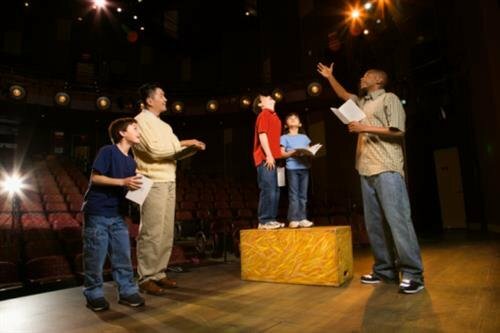 For those who love the craft of the stage as well as teaching students about their passion in life, becoming a drama teacher can be the most rewarding career imaginable. A thorough knowledge of all aspects of the thespian craft, however, along with the willingness to teach some non-related courses may be a prerequisite for employment. In order to become a teacher, it is necessary to attend a four-year university and graduate with a degree in education, or complete post-graduate studies in their specific discipline. Nearly one hundred thousand Americans today enjoy employment as an instructor of the arts, such as theatre or music or art. The growth trajectory of this career path is much slower than many other education-related professions, with an increase of just over two percent for the next decade. Though the growth is slow, the rewards are considerable: an average drama professor earns over seventy thousand dollars per year, while the top ten percent of earners make over one hundred thousand dollars per year. Drama teachers can be divided up between two distinct professions: those who teach in secondary schools and those who teach in post-secondary schools. Any teacher in a secondary institution will work in a public or private high school, while any teacher in a post-secondary school will work at a university or community college. For secondary instructors, it is necessary to complete a four-year degree in education and then become certified as a public teacher in their state; while some private schools have different requirements, most prefer a background in education. Secondary schools offer additional pay raises and advancement for any teachers who have completed advanced degrees. For post-secondary instructors at the community college level, it will be necessary to complete a master’s degree in theater or education. Anyone interested in becoming a full professor at an accredited four-year university will need to complete a Ph.D in theater or drama education in order to find work. The more education a teacher possesses, the more likely they will be hired for a particular job: it is not uncommon for Ph.D holders to work in public schools or community colleges due to the competition for jobs, even if it is not a prerequisite for finding work. In some cases, it may even be more lucrative to work in a secondary institution than it would be in a post-secondary institution. Working as secondary school drama teacher gives most instructors a fair amount of freedom to run their classes, as most schools have only a handful of drama instructors (indeed, many have only one). The downside usually is that most secondary schools cannot devote a full day to teaching theater to their pupils, meaning that a drama teacher will usually need to instruct other courses, such as public speaking. Many secondary school drama teachers are explicitly expected to assist, and in many cases direct, the school’s annual theatrical productions, which require an investment of time after the school day is done. A full three months of time off during the summer, however, balances this time commitment. Drama instructors at the university level are able to craft and teach their coursework using whatever syllabi and texts they prefer. Tenured faculty members enjoy so much autonomy that they have virtually no oversight. The downside, however, is that a tenure-track faculty member will need to research and publish their findings on theatre, generating at least one independent piece of scholarship that will be reviewed by departmental colleagues. Teachers who cannot create influential pieces of scholarship will be released from the university and will have to find work in another school.